Browse our most frequent questions and answers. below to learn more! At AdventureMania Inflatables, safety is our number one concern. As long as the rules are followed and there is an adult(s) supervising at all times, your event is sure to be injury free! Does AdventureMania Inflatables carry a TSSA license? Yes, AdventureMania Inflatables has been licensed to operate inflatables since 2002. License number AD2565. Does AdventureMania Inflatables carry Liability Insurance? Yes, AdventureMania Inflatables carries Five Million in Liability Insurance. We are also happy to name you and your organization as an additional insured at no extra cost should you require this. To-date, we are pleased to announce, we have never had an accident. This is due to the care we take in setting up and training the supervisors. What type of supervision is required? For the safety of the participants, each unit requires at least one adult supervisor at all times. 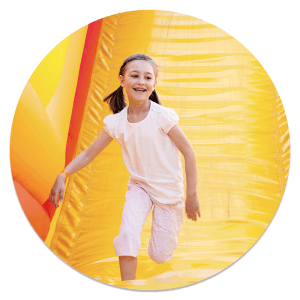 For our larger pieces, such as slides and obstacle courses, two supervisors may be required. Supervisors must be 16 years or older. Supervisors are responsible to ensure all participants follow the manufacturer’s rules and regulations to ensure public safety. Trained supervisors can be hired for an extra fee. Does the price include setup and delivery? The price listed on the website is the rental price. Delivery charges will vary depending on the number of pieces of equipment and the city where the event takes place. Once we deliver the items, we will setup and sanitize the equipment. We will also return to tear down the equipment and bring it back to our warehouse. Please contact our office for a delivery price. Items that are rented and brought to your place of residence may be picked up to avoid delivery charges. If you choose to pick up the equipment, you will need to setup the equipment yourself and return the equipment between the scheduled warehouse hours. Setup instructions are provided and we are available 24/7 via phone. What cities are included in your delivery route? We deliver to the following areas: Milton, Georgetown, Acton, Oakville, Burlington, Hamilton, Stoney Creek, Brampton, Woodbridge, Vaughan, Markham, Thornhill, Richmond Hill, New Market, Concord, Etobicoke, Mississauga, Toronto, Caledon, and surrounding areas. We will also deliver outside of these areas, simply ask and we will give you a delivery quote. To avoid disappointment, we recommend booking well in advance; we will certainly try to accommodate any last minute requests. To make a reservation, simply add the items to your cart and check out. We will call you as soon as possible to confirm your reservation. You may also call us at 905-864-3290 or 416-953-0767 and we will be happy to take your reservation. Alternatively you may send us an email at info@adventuremania.ca. Is there a deposit required to reserve your equipment or services and what if I need to cancel? Yes, a 25% is required to confirm your reservation. Deposits are NON-REFUNDABLE. If for some reason, you need to change your date or need to cancel your event; all deposits can be transferred to a future date with no expiry. There is no expiry date on the in-trust deposit it has no cash value only for rental. Cancellations 14 days prior to the event date will be subject to a 50% penalty. Cancellations within 14 day of the event will be subject to 100% of the rental contract. This is the most flexible and reasonable deposit and rescheduling policy in the industry. We accept Visa or Master Card over the phone. You may also pay by email transfer, cash or bank draft. We also accept company cheques but we DO NOT accept personal cheques. How will I know if the equipment will fit into my space? You will find the measurements for each piece of equipment located on our website. It is the customer’s responsibility to ensure that you have the required space (Width, Length & Height). You should also have a foot or two all around. We recommend that you double check your space prior to ordering. Once we arrive at your location, you are responsible for full payment if the equipment does not fit. Do I need to be available when you deliver the equipment? A representative from your event must be at the location at the time we arrive for setup. Our staff will ensure that the equipment is placed in the exact preferred location. Once in place, we will not relocate the equipment. Once the equipment is setup and sanitized, we will go over operating instructions and collect payment. How long do I get the equipment? Our usual rental duration is a standard 4 hour time period. If your event is longer than this standard period we will be happy to extend the rental time at NO extra charge. We offer, by far, the most flexible same day rental period in the industry. Does the rental period include the setup and teardown times? No, the rental period does not include the time it takes to setup and tear down. This time is in addition to the rental period. We will show up before your rental time to setup the equipment so everything will be setup on time for you to enjoy. Do I need to keep the equipment plugged in at all time? The equipment is powered by blower boxes that supply continuous air to the inflatable therefore you will need to have the equipment plugged in for the entire time. Once the equipment is unplugged the equipment will deflate. We will require an outlet within 50’ of the unit. What if I do not have power at my location? You may rent a gas powered generator from us. Ask our representative for details. What is the difference between Public and Private Events? A Private event is an event that takes place on someone’s residential property. What surface can you set up on? We can set up on Grass which is the safest for the children. If need be, we set up on dirt, asphalt or concrete. We are also able to setup indoors, if space permits. Our delivery team will not lift inflatables over fences, squeeze equipment through small gated areas, or carry equipment up or down large flights of stairs. Are we responsible for the cost of the equipment should the equipment become damaged while in our care? If damage occurs due to negligence while in your care, you will be responsible to pay the cost of fixing the equipment. You may purchase our damage insurance for only $10.00. This will protect you in the event of any damage while in your care. Yes, you may pick up your equipment but only if the equipment is going to a residential property otherwise we are legally required to deliver and setup the equipment. What do I need to bring in, in order to receive my equipment? You will need to bring in the balance of your payment, a signed copy of your invoice and contract (if you have not electronically forward this to us), a major credit card (Visa or Master Card) and a copy of your Driver’s License. If I pick up the equipment for my residential use, what charges will occur if I do not return my equipment on time and in accordance with my rental agreement? We ask that you respect your rental agreement with us and return all equipment based on the time stipulated on your rental contract. You may very well affect another party who has rented the equipment after you if you do not return the equipment on time. Should you not adhere to the return time on the rental contract, you will be charged for an extra rental period. No exceptions! Prior to returning, do I have to clean the fun food equipment? If possible we would appreciate that you remove any unused fun food from the machine, but no actual cleaning is required. Feel free to use our Contact Form below to reach out to us anytime.